I’ve been on a pie kick lately. I’m a pie kind of girl and when I’m extremely busy and need a delicious dessert, pie is usually easier to make than a cake. Plus, who doesn’t love a good piece of pie? Strawberry Cheesecake Pie is not only pretty, but it’s tasty, too. Whenever the entire family comes over, I always make two pies because one just won’t cut it. I served this one a few weeks ago alongside the Kiwi Pistachio Pie. They were both winners. We couldn’t decide which pie we liked the best. When it comes to pie vs. cake, it’s a great debate. I like a good, moist cake and I’m happy to say that all of my cakes I bake are over-the-top moist. But if I had to choose between pie and cake, I’d go with pie just about every single time. Except – I forgot about cobblers. I’m crazy for cobbler, especially Pecan Pie Cobbler. Oh, and my mom’s blackberry cobbler. And peach cobbler. And they must have a big scoop of vanilla ice cream on top. OK – let’s get back to pies. I got a tad off course talking about my favorites. 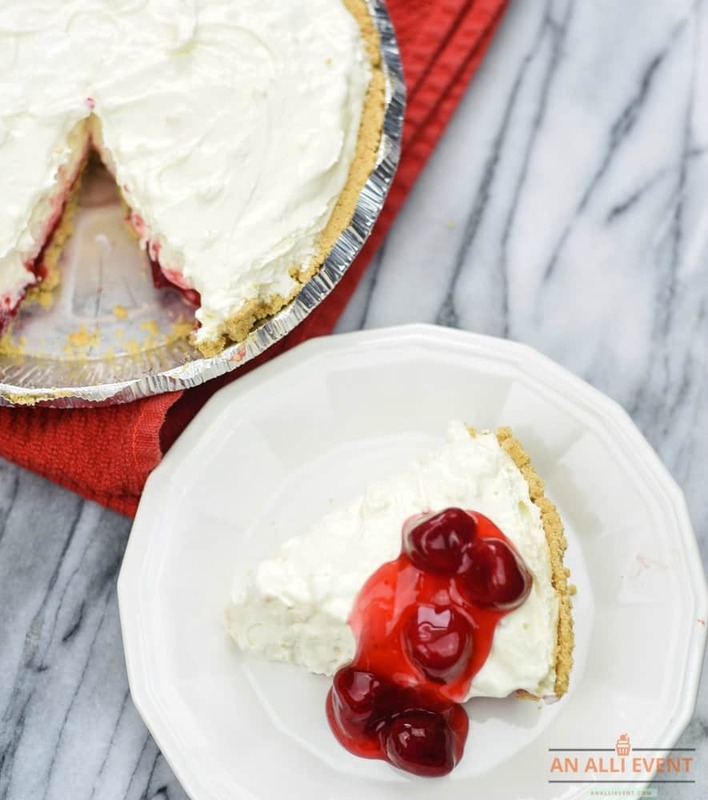 This Strawberry Cheesecake Pie is also a huge favorite and it’s so easy to make. Really, there’s only 3 steps and bam, you’re done. You could also use other pie fillings to make this pie. Cherry would be amazing too. Spoon 3/4 cup pie filling in a graham cracker crust. Pour milk into a large bowl. Add Cheesecake instant pudding mixes and whisk for 2 minutes or until smooth and thick. Fold in whipped topping and spoon over the pie filling in the crust. Refrigerate for 3 hours or overnight. Top with remaining pie filling before serving. Store leftovers in the refrigerator. Spoon 3/4 cup pie filling into crust. Pour milk in a large bowl. Add the pudding mixes and whisk for 2 minutes or until smooth and thickened. Fold in whipped topping. Spoon pudding mixture over the pie filling in the crust. Top with remaining pie filling before serving. So, are you team pie or team cake? I can’t wait to make this for my husband because he loves both Cheesecake and also Strawberries. Along with my son for his Birthday. This pie looks SO amazing. And I like how it’s part cheesecake, another one of my favorite desserts. I know I’d gobble this right up. My husband loves cheesecake. I know for a fact that if I made this he would not share it with anybody LOL. It looks so good. I love grapefruit but I have never had a grapefruit pie. I am curious and would love to try a slice, must be delicious! This recipe combines two things I love: strawberries and cheesecake! I’m definitely going to bookmark this recipe to make for me and my husband! Thanks for sharing! HOLY MOLY this looks amazing. You’re right, delicious, yes it looks that way! I have never had cheesecake before in my life though, how crazy is that?! oh my gosh- my family is such a huge cheesecake fan but i never thought to add some strawberries and a PIE at that- YUM! i cant wait to make this in the spring when strawberries are a little bit more in season! I’ve never had cheesecake pie before. I’m sure this recipe taste amazing. Looking forward to giving it a try. That pie does look amazing, I love cheesecake and topping it with fruit makes it a dessert everyone will love. Making it yourself is that much better. I admit that I am a cheesecake addict, so if I can learn how to make a new cheesecake pie recipe, I am all for it. This strawberry cheesecake looks delicious. Wouldn’t this be delicious on your Easter table? What a great dessert to make and take with you to a pot luck! This sounds so good! I might have to make this the next time we have guests over. This looks so good. My husband is a big fan of anything strawberry cheesecake. I am drooling over this pie! This Strawberry Cheesecake Pie looks heavenly! So perfect for our Sunday gathering! Your pie looks enticing and it’s making me hungry. I would love me some pie right about now. You had me at cheesecake. My husband would love this as he is a big strawberry fan. I need to save this recipe so I can make it for him. I can’t wait to try this my hubby loves cheesecake. it has been ages I made a cheesecake. This cheesecake pie sound perfect treat . I love how vibrant they turned out too. I bet they taste amazing. I want a piece of pie right now. Bookmarking to make later. Thanks! I anfloored at how good and how simple this recipe is. Man o love cheese cake.